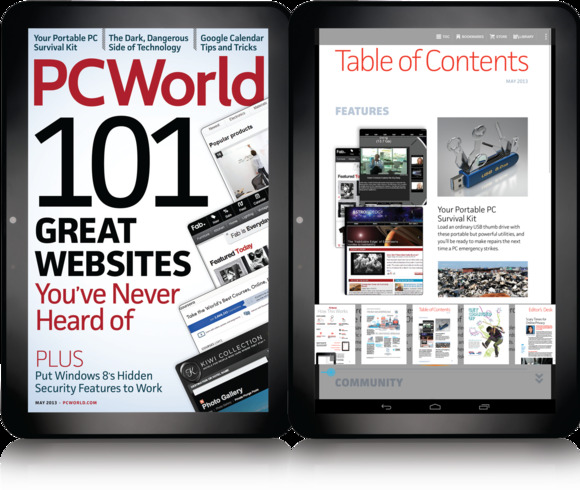 We’re happy to announce that PCWorld Digital Magazine is now available in an Enhanced Android Edition—and along with the Enhanced Kindle Edition, we’re launching the Enhanced Android Edition free for print subscribers! The Enhanced Android Edition is available now for free download from Google Play, and supports any Android tablet with OS 3.0 and higher. If you’re not a print subscriber, you can buy a single issue for $6.99, or subscribe to PCWorld and get the Enhanced Android Edition for free (a $39.94 value). The Enhanced Android Edition brings you the best possible experience of PCWorld magazine on any Android device, and includes optimized pages and support for high-resolution displays. The enhanced format enables us to provide rich multimedia content not available in print, including videos, interactive slideshows and features, and other elements. And because we’ve remastered the magazine content into an Android-friendly layout, you can use the intuitive gestures and touchscreen capabilities native to the Android platform to navigate each issue. Your options include using the interactive table of contents, swiping from page to page, or gliding through article content with the tip of your finger. Embedded links take you directly to related information within the issue as well as to websites for additional content, and the app allows you to bookmark and share articles via email and Twitter. 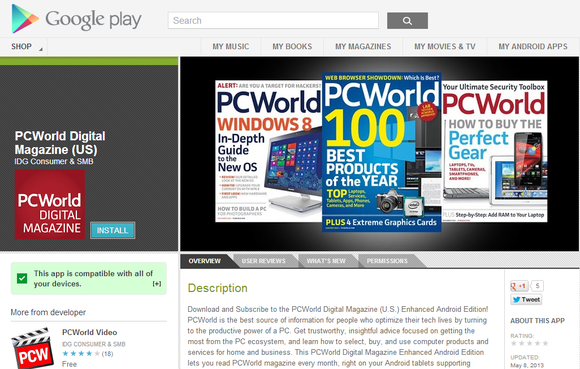 Print subscribers can access the PCWorld Enhanced Android Edition, for free, in three easy steps: Download the app from Google Play, tap My Account to log in, and enter the email address you provided when you signed up for your print subscription as well as your PCWorld magazine account number (located on any print issue). Once you’ve logged in, your free issues of the Enhanced Android Edition will appear monthly in the Library section of the app. If you aren’t sure what email address you entered at the time of your subscription order, or if you need to add your email address to your account to get access, visit PCWorld Magazine Customer Service and update your account. For detailed directions with pictures, see pcworld.com/subscribe/free-android. To learn more about the other Enhanced Editions we have available, visit pcworld.com/subscribe/digital; or, for other types of subscriptions and magazine formats, go to pcworld.com/premiumcontent/magazines.